This 5pm Dining blog scribbler has just returned from a fortnight’s holiday to find an inbox stuffed with juicy nuggets of food news which we will be dropping into the blog over the next few days. First up, we were astonished to learn that Marco Pierre White is to open his first Scottish restaurant in Dumfries. The pioneering and formerly mercurial chef is to open a branch of Wheeler’s of St James’s in the Aston Hotel in Dumfries. 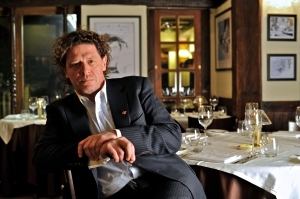 Much like Albert Roux who has opened restaurants in Inverness, Muirfield and Lochinver, MPW has eschewed the bright lights of Glasgow, Edinburgh or Aberdeen to make his mark in Scotland’s country house hotel market. Chefs trained by Marco and his team, in one of his existing Michelin star restaurants, will aim to serve honest, high quality food at affordable prices at Wheeler’s of St. James’s Dumfries. The new restaurant will launch of the 28th of November.